This week, we are looking at the Parents’ Review article entitled, “Family Bickerings” written by Leader Scott. I don’t know about you, but I was amazed the relevance of this article, written over 100 years ago, to the modern family — at least it was very relevant to our family! Scott is clear that bickering in the family leads to lost love and loosening of the family bond. While the quarrels of young children often centre around possessions or rights, if allowed to continue, they will simply become more sophisticated in adulthood. The ‘heart issues’ behind the quarrels will not go away as a child grows simply because he has gained in years. The author points to moral training as the key. A few parents seem to know this is the case, but most don’t. (I certainly didn’t really think there was a whole lot I could do about it.) Scott says that a child’s character contains everything necessary for the development of a host of good qualities, but depending on the training, each quality can become a virtue or it’s opposite — a vice. For example, “generosity may become either a Christian liberality, or a selfish wastefulness.” (This reminds me of a family joke we have that puts a sarcastic ‘positive’ spin on greed. “Well, B, you were certainly very generous — to yourself.”) We make virtues grow by teaching a child to love others and vices by indulging the love of self. According to Scott, family bickerings are caused by: 1. selfishness and 2. harsh judgment of others. He confirms my own experience the punishment in useless in changing bickering to harmony. Basically, he says indicates that virtues will only come forth with inspiration — never by force. Keep your cool when children bicker. Avoiding your own anger, explain that the children’s unhappy feelings are the natural result of being unkind to others. Inspire children with stories of goodness, of love and self-denial. Offer children opportunities to practice sacrifice (but don’t force acceptance) for a sibling. He gives the example of offering a child the opportunity to give up her ‘turn’ to go for a drive with mom in order to make a younger sibling happy. We are warned that the child will very often say, ‘No’ and we can simply respond by pointing out the happiness he has missed in giving a gift to another. Have a strict policy of not allowing children to criticize each other at all. Scott says that this will stop over half of all bickerings. Inspire your family with scriptures. There are a number of excellent ones in the article. Memorizing as a family ensures everyone is on the same page. I am going to add these ones into our regular memory rotation. I found the author’s approach to this subject very refreshing. I think, particularly, one idea that inspired me was that I don’t have to constantly ‘get to the bottom’ of a quarrel. I can remember talking with a friend about this saying, “I just don’t have the parenting skills to figure these things out — to perform an inquisition each time there is a fight!” My friend, whose children generally get along quite well (certainly largely due to their excellent parenting) replied that she often just speaks to both children generally about treating others with love and respect. She asks them to think about whether they would like to be treated the way they had treated the other sibling. Using family bickering as an opportunity to inspire our children to banish selfishness and cultivate generosity and self-sacrifice seems like the best possible character training ‘program’ in existence. Real life situations that arise in safe, family relationships are the perfect context. Good thing we have so many opportunities for character development here! What were your thought about the article? Did you find some inspiring ideas for your family? Late Sunday afternoon, I was finally prepping my kitchen for a desperately needed paint job. I really dislike doing home renovations, so for me to get over the hurdle and begin a job like this involves a lot of effort. While I was busy wiping down walls with TSP, my three-year-old came into the house howling saying she had been hurt. Apparently, my 10-year-old son tied our wagon onto his bike and was pulling her around ‘slowly’. (10yods and I have different definitions of ‘slow’.) The wheel on the wagon buckled under, the wagon tipped and my daughter was flung out (of the slow-moving wagon). I didn’t like the way she was screaming and grabbing her neck. I am a non-worrier almost to a fault. Taking after my own dear mom, our kids have to practically have a limb fall off before I will take anyone to the doctor. However, when my child is screaming and grabbing her neck with no apparent injury on the outside, my mommy-antennae go up. We quickly decided she needed to go to the hospital. For a moment, I considered the fact that it is unwise to move someone with a neck or back injury, but decided we should go by car. However, our oldest daughter spoke out what I had been thinking, saying we should call an ambulance. She was right and I made the call. The ambulance attendants were wonderful. Afterwards, my oldest daughter and I actually wondered if they send out specific people when they know there is a child hurt because they seemed to be so terrific with our little one. While the attendants were checking her over, they became reassurred that there was no head or neck injury. However, as soon as they started to check her clavicle (collar bone), Steve and I both slapped our foreheads, “OH! Of course! The collarbone!” Our 5 year old daughter broke her collarbone when she was three and this daughter’s behaviour was completely consistent with that injury. We had a fun ride to the hospital in the ambulance. One attendant made our daughter a purple rooster by blowing up a glove and tying it off with medical tape. Upon arriving to the hospital, we were met by some lovely and reassuring nurses who were very sweet to our little injured girl. Shortly after, she saw the pediatrician who complimented her excellent verbal skills. “She is able to say just what is wrong, like an adult!” I think she is very articulate and speaks quite clearly, but I think what really makes a difference is that she is not shy. Any of our other children and the majority of three year olds will clam up when a stranger talks to them, particularly a male. However, our 3yo will just start chatting up a storm! She had a pretty restful night, all things considered and required no pain medication after that first night. She is quite a little trooper, just going about her normal activities with her arm in a sling. She still has her hospital bracelet on. I’m not sure how I will get that off of her. I think she really likes it. We’ll see you tomorrow for a look at this week’s Parents’ Review article, “Family Bickerings“. In continuing our ‘mommy brain sharpening‘, this week, we will be reading the article entitled, Family Bickerings by Leader Scott. I will post my thoughts on Thursday and I hope you will post yours, too. I started knitting almost exactly two years ago. As I have said before, I hate relaxing. I find it very un-relaxing. Now, that doesn’t mean I don’t like to sit down. I just hate sitting there doing nothing. I am even wound up enough that during the first 24 hours after having a baby when the midwives force me to stay in bed and rest, I am dying to get up and at least go downstairs where all the action is! Knitting allows relaxing, for me, to be relaxing because I am being creative and productive while I am doing it. Two years ago, I decided to learn to knit specifically so I could knit socks. 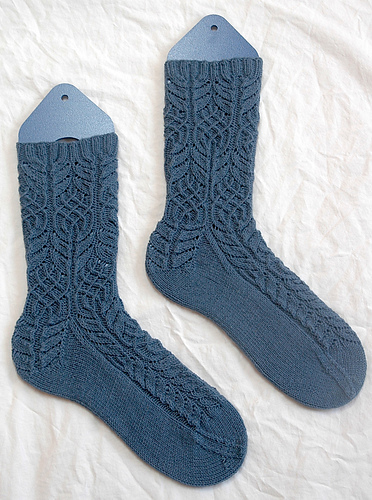 Handknit socks are beautiful, useful and very portable. My purse almost always contains a small work-in-progress bag housing a pair of socks I am working on so that I can whip them out anytime I have a few minutes to fill. It makes unexpected waiting around very pleasant. When I first started to learn to knit socks, I knit ‘plain vanilla’ (meaning just stockinette — or for non-knitters, that means just straight knitting around and around) socks which were jazzed up by the use of self-striping sock yarn. Self-striping yarn changes colour all by itself giving the impression that you have done a whole lot of fancy colourwork. It is terrific for anyone, but particularly for beginners. Two years ago, I tried to learn everything I could about knitting socks. I used to look longingly at other people’s complicated projects, sighing as I realized they were so far beyond me that I would probably never knit like that and would always just knit plain vanilla self-striping socks. I can remember, specifically, looking at several people’s Twisted Flower socks such as these or these (this one is the designer’s blog). I knew I would never be able to make them. Well, guess what?! A few days ago, I finished up my very own pair of Twisted Flower Socks! And, after two years of knitting, I can honestly say they were a breeze. I didn’t feel stressed out or even overly challenged while knitting them. I feel as if I have truly arrived in the sock knitting world. If you are a new knitter, I want to offer you a huge round of encouragement. It doesn’t take long before you will be knitting things you never dreamed you could knit. I have been wanting to write a post on my own experiences with internet addiction, but I haven’t been quite sure how to go about it. I am still not completely sure, but I am eager to write in the hopes that it might be helpful to another mom somewhere out there. About three years ago, I started to become very concerned that I might be addicted to the internet. I was visiting a wonderful message board way, way too often. I would check in multiple times a day (and that is an understatement) and post frequently. I enjoyed the things I learned, but what I really loved was helping others. I was delighted to encourage a new mom or to be able to perk someone up when they were needing a ‘friend’. I built a real community on the board I visited. The problem was that when I tried to read a book or make a meal or clean my home, I felt almost magnetically pulled back toward the computer. I couldn’t seem to tear myself away. There were times I would log onto the message board and two hours would go by. After I logged off, I would actually have physical affects (panic-like symptoms) from being on the computer for so long. I prayed and prayed about whether or not I had a problem. Being fairly certain I did, I then prayed a lot about what to do. In the spring of 2007, God allowed our computer to crash so that we could no longer use the internet at home. We took our time having it fixed and I was gifted back a huge amount of time I had been missing from my life. I suppose you could say that my addiction ended cold turkey. I had been unsuccessful at setting limits for myself in the past, so this was truly a huge relief for me. During the period our internet was not functional, I had a lot of time to think about why I would have become addicted to a message board. I believe that, for me, it was a matter of my need for community. Knowing why it was happening was a big part of being able to get past my addiction. The internet is often used for forming community with others. This could be good in some circumstances, but I think for many more people — definitely for me — it is harmful. Using the internet to meet my needs for community meant a number of things were happening. First of all, it took up time that I would otherwise be spending elsewhere, in all likelihood on something more worthwhile. I found that my internet time was coming from keeping my home tidy, parenting my children, spending time with my husband and reading good books. Second, when meeting my need for community on the internet, I found that I had less need (and time) to spend with my real-life friends. I have some fantastic real-life friends and I am very grateful that God led me to a place where I recognized what was going on before I seriously damaged my friendships. Third, I believe my sense of reality was being skewed. This one is more difficult to explain. When a group of people participate in a message board/e-list on a particular topic, the group often does not mimic any group of people that could possibly exist in real-life. For example, let’s say you participate on a message board for people who eat marshmallows for breakfast everyday. There could be 100 active participants on the list and tons of interesting off-shoot topics to read. If you spent enough time there it would start to feel a lot more ‘normal’ than it really is. Without anyone to say that eating marshmallows for breakfast was unhealthy or unwise, there are no checks and balances for the participants. Everyone there eats marshmallows for breakfast. It is very unlikely that your real-life friends would ‘understand’ your marshmallow philosophy (and your need to constantly shop on the community’s Marshmallow For Sale or Trade board) so you would end up feeling less connected to your real-life friends and more connected to your internet ‘friends’. I was just starting to feel this way when God graciously pulled the plug on my internet. I am by nature an introvert. I am friendly and comfortable around people and love to spend time with friends. However, I am energized by quiet and solitude, whereas an extrovert is energized by being around lots of people. As much as I do enjoy being with people, I am a real homebody and often have to force myself out the door. It just feels like so much work to go out. As an introvert and a mom to many young children, it was extremely easy to meet my need to connect with others via the internet. When I realized what was happening, I determined that I would avoid any kind of ‘friendships’ on the internet. I immediately stopped posting on the message board and decided I would no longer participate in any type of message board. Later on, I did find that I sometimes really needed some information or a question answered that was best done on a message board/e-list. Being broken of the constant habit of ‘checking the computer’, I can now use internet message boards on a minimal, non-relational level quite safely. However, I always keep my antenna way up for any signs that I might be getting too involved. I participate on a knitting board, but the second I find myself typing up posts encouraging someone in parenting, I feel a red flag go up and I stop typing and turn off the computer. There is no point offering parenting encouragement while allowing my own children to parent themselves. Awhile ago, I came across a blog post entitled, “I was a better mother before the internet“. It was very helpful in inspiring me to reach for something better than being a mom who spends hours and hours on the computer everyday ‘learning’ about parenting and homemaking. I love my family, as all of you do, and I want to do my best to fulfill the wonderful calling God has given me in caring for them. The article helped me to ask myself the question, “Is this particular use of the internet a help or a hindrance to my calling?” I find I can also be pulled away from my family if I start to invest too much time reading blogs. Obviously, I think blogs are terrific and I love to encourage others through my blog. At the same time, I think they can be a snare to us because they connect us to the writer in a way so that we feel as if the writer is our ‘friend’. Too much of that and a mom can find herself hooked on the internet as I did two years ago. We are keeping our Mommy Brains sharp by reading along some of the articles in the archives of The Parents Review. This week’s article is entitled, “Parents as Inspirers” by Charlotte Mason. Charlotte Mason compares a child’s destiny to virgin soil — nothing has been sown in it. I like this idea because that soil has a capacity to grow beautiful, abundant fruit, to bear a thorny bush or, worst of all, to bear nothing. She points out that the first sowing is done either by the parents or by someone the parents choose. Charlotte tells us that parents are to sow the mind’s proper food – ideas – and, in fact, this is our only educational instrument. What does this mean, that ideas are the only educational tool we really have at our disposal? It means that a child will retain nothing his person does not have need of. The only things a person will truly retain and use are those things – good or bad – that have affected him in some meaningful way. And, really the only things that can do that are ideas. She points out that if it were any other way, if children were empty containers to be filled with information, putting them into an educational system and depositing the same information for everyone, then everyone would end up being exactly the same. Rest assured, she reminds us, that there is no danger of this because God has taken care to craft each person with a unique personality that He will ensure is preserved to be used for his purposes. I love the idea she sets forth that parents are ‘inspirers’ as opposed to ‘modellers’. While Charlotte speaks seriously of the intense responsibility this entails, I actually find it very freeing. A ‘model’ is something that is directly copied. It must be perfect since the ‘copies’ can be nothing more than the original. Any defects will be reproduced exactly, as will the positive features of the model. It will be exactly the same. An ‘inspirer’, however, is entirely different. Just like a stunning landscape may inspire a weaver to make a beautiful cloth of many shades of green or a painter to create a lovely piece of watercolour impression, a child living alongside his parents will be inspired by their character, their behaviour and their hearts to become the artwork God has created him to be. A child is never to be a direct reproduction his of parents, simply copying modelled behaviour. (Thank goodness!) A parent inspires one child in one way and another in a different way, despite the fact that the parent is the same person. Charlotte reminds us that “To excite this appetency towards something — towards things lovely, honest, and of good report, is the earliest and most important ministry of the educator.” This reminds me of when our first son was about 5. We used to drink soy milk at that time and were out somewhere where my son was offered a glass of milk. He brought it to me, very displeased saying he couldn’t drink it because it tasted awful. I tried it and it was perfectly fine. The problem was that after he was weaned from mommy’s milk, the milk he knew tasted completely different than that which he was given in this place. Charlotte says that many times our children do not and, in fact, may never think specifically of the ideas we inspire in them, but “all his life long they excite that ‘vague appetency towards something’ out of which most of his actions spring.” Our children will face all kinds of things in the world. What we are trying to do in our homes, is make sure their palettes have developped a taste for goodness so that when they encounter something wrong in the world, it will be uncomfortable to them even if they can’t always identify exactly why. We cannot set about to complete a simple course of study and teach these things one by one. Rather, a child is inspired by his parents, and I would add of course many others in his life, as he lives alongside them, watching their interactions with others, reading books presented to him, having conversations. This is why God tells parents, “These commandments that I give you today are to be upon your hearts. Impress them on your children. Talk about them when you sit at home and when you walk along the road, when you lie down and when you get up.” (Dueteronomy 6:6-7) We learn about things as we live, when we are ready to learn them. The fact that, as parents, we have faults — serious ones — that we are sinners is not the point. No matter what we do, our children will also be sinners with faults. What I find so exciting is that, as inspirers, I need not be perfect. I need only to rest in my Heavenly Father’s calling to be a humble servant. This is his desire for my children and the greatest thing I can inspire in them. I’d love to hear your comments, whether or not you read the article. Something came up today and I wasn’t able to put together a post about our current article. I expect to have this together for you tomorrow. I hope you will join me. Also, I have prepared a post on Internet Addiction that will be added to my blog on Saturday. I hope it will be helpful to someone.